Pycnodysostosis was documented as far back as 1962 by Maroteaux and Lamy and is also known as Toulouse–Lautrec syndrome. It is a rare autosomal recessive disorder with a prevalence rate of 1–1.7 in one million. Pycnodysostosis is defined by a short stature, acroosteolysis (resorption of the terminal phalanges), generalized osteosclerosis with fragile bones, open skull sutures, and dysplasia of the clavicle. Minor trauma can also give rise to fractures in such patients. A 25-year-old female measuring 140 cm in height and weight 38 kg reported to the oral medicine and radiology department, with a chief complaint of swelling in and pus discharge from the left mandibular body region since 15 days [Figure 1]. 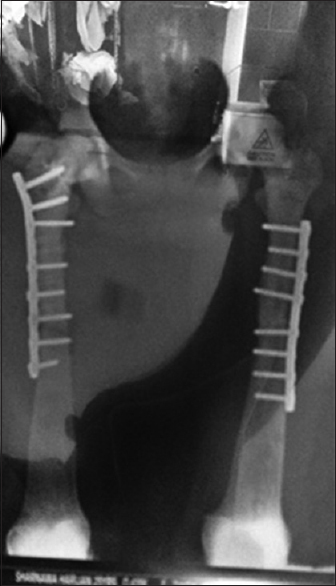 The patient had a history of bilateral femur fractures 1 year ago, which was preceded by only minimal traumatic event. This was treated surgically with bone plates and screws [Figure 2]. Her medical history was insignificant with no history of parental consanguinity. Patient was fully immunized with normal developmental milestones and intelligence. General physical examination revealed dysmorphic features such as short stature, frontal and bilateral parietal bossing and hypoplastic midface, short, broad, spoon-shaped, stubby digits, and dysplastic grooved nails, toes showing sandal gap deformity [Figure 3] and [Figure 4]. On extraoral examination, swelling and pus discharge in relation to the left mandibular body. Dental examination revealed inflamed gingiva with pus discharge in the left lower posterior edentulous region. 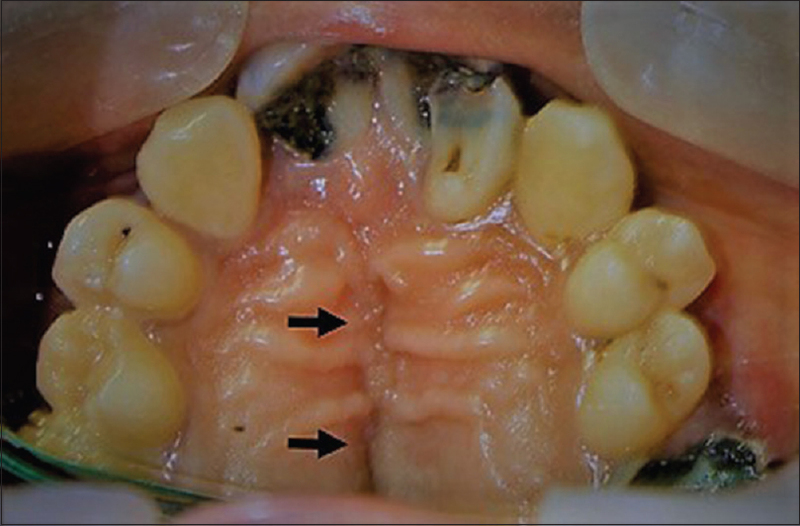 On hard-tissue examination, high-arched narrow grooved palate, microdontia, crowding, missing teeth, and multiple carious teeth were reported [Figure 5]. The above-mentioned clinical findings led us to a provisional diagnosis of chronic suppurative osteomyelitis. Differential diagnosis was based on general examination, intraoral features, and patient history and following were suspected, osteopetrosis, pycnodysostosis, and cleidocranial dysostosis. The patient was subjected to further investigations. Panoramic radiograph (orthopantomogram) showed both maxillary third molars to be microdontic, maxillary right lateral incisor was palatally malposed, maxillary left lateral incisor was missing, and impacted maxillary left second molar. Notably, bilateral sequestra presented in relation to mandibular body region, presence of obtuse mandibular angles, resorption of posterior borders of rami, elongation of the condylar apophyses giving mild beaked shape condylar appearance, partially pneumatized maxillary sinuses, generalized osteosclerosis of maxilla, and mandible with fracture of inferior border of mandible in the left body region [Figure 6]. 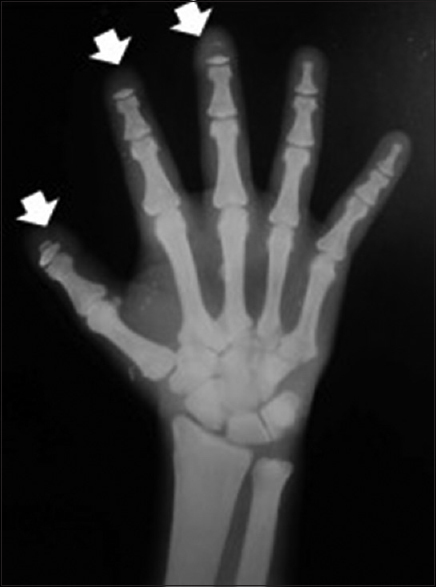 Hand–wrist radiograph showing acroosteolysis of distal phalanges and osteosclerosis [Figure 7]. 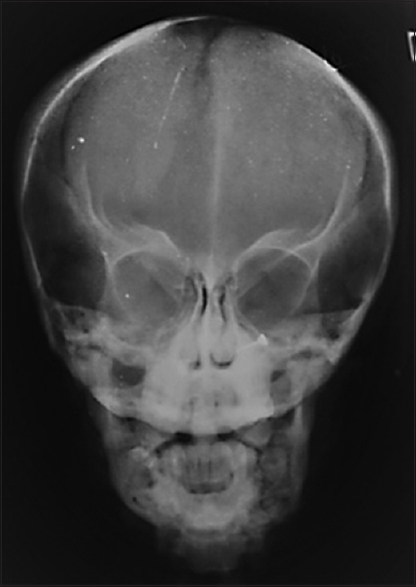 Skull and facial plain radiographs and computed tomography scan showed a brachycephaly, with persistent open fontanels and wide sutures, thick calvarium, generalized osteosclerosis of skull and facial bones, and abnormal articulation between anterior arch of first cervical vertebrae (C1) to occipital condyle on the right side. The maxilla was hypoplastic with nonpneumatization of the frontal sinuses and depressed nasal bridge. Underdevelopment of the mandible was noticed with an obtuse jaw angle [Figure 8],[Figure 9],[Figure 10]. All laboratory investigations were normal, including liver and renal function tests, serum electrolytes, serum calcium, and phosphate. Alkaline phosphatase level was found to be within normal limits. The characteristic clinicoradiographic features led us to a probable diagnosis of pycnodysostosis with suppurative osteomyelitis of mandible. In the above case, the left body of the mandible showed a pathologic fracture; hence, sequestrectomy and saucerization were carried out along with plating along the inferior cortex of the mandible. Similar treatment is planned for treating the osteomyelitic changes seen on the right side. Other exceptional and rare findings of this case were sandal gap deformity which was reported by Mujawar et al. and vertebral segmentation anomalies such as abnormal articulation of C1 to occipital condyle have been observed. This condition is usually diagnosed at a young age due to the typical clinical appearance with dwarfism and dysmorphic facies. However, in some cases (as seen in the present case), it may sometimes be diagnosed at a later age as a result of complications such as fractures and infections due to decrease bone vascularity and increase in bone density. In such patients, cognitive functioning and life expectancy are unaffected. Pycnodysostosis is usually diagnosed based on clinical and radiographs features. A CTSK gene mutation analysis is the gold standard confirmatory test but it was not done in our case because of its high cost. Osteomyelitis is the most serious complication of pycnodysostosis; in our case patient presented with bilateral osteomyelitis of the mandible which has not been reported so far. Previously mentioned, inappropriate remodeling of bone by dysfunctional osteoclasts, while bone formation continues normally. This leads to brittle bones and decreased vascularization which will continue to worsen with age. The increased susceptibility to osteomyelitis with age can be attributed to the increased endosteum bone production, which gradually eliminates the medullary spaces in the jaws and compromises vascularization and the local immune defenses. In adults, osteomyelitis with pycnodysostosis is common but in children, it is uncommon. Obstructive sleep apnea (OSA) has been reported in young children with pycnodysostosis often with fatal outcomes. OSA is defined as the cessation of respiratory air flow for longer than 10 s more than thirty times in a 7 h period. The craniofacial abnormalities in pycnodysostosis decrease the upper airway space and increase the risk of respiratory insufficiency. Pycnodysostosis is a rare syndrome that is diagnosed based on its clinical and radiographic features. Pycnodysostosis includes group of disorders that requires a multispecialty approach. The importance of early recognition of clinical features in the diagnosis allows correct treatment planning and reduces the chance of complications in future, thus ensuring a better quality of life to the patient. Underdiagnosis or misdiagnosis of patients is a major concern; therefore, awareness about pycnodysostosis is a must. We thank Dr. Satoskar Sujata K. (Assistant Professor, MDS), Dr. Shenoy Aarthi (Lecture, MDS), Dr. Figueiredo Nigel R. (Senior Resident, MDS), and Dr. Amate Sachin (Senior Resident, MD radio diagnosis) for their support and guidance in preparing this article. Maroteaux P, Lamy M. Pyknodysostosis. Presse Med 1962;70:999-1002. Mujawar Q, Naganoor R, Patil H, Thobbi AN, Ukkali S, Malagi N. Pycnodysostosis with unusual findings: A case report. Cases J 2009;2:6544. Fleming KW, Barest G, Sakai O. 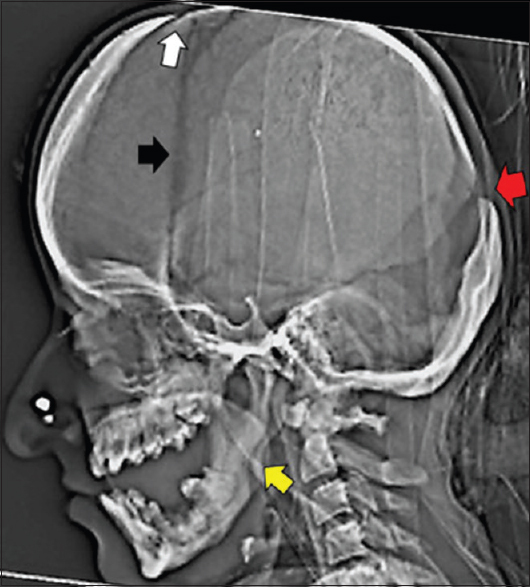 Dental and facial bone abnormalities in pyknodysostosis: CT findings. AJNR Am J Neuroradiol 2007;28:132-4. 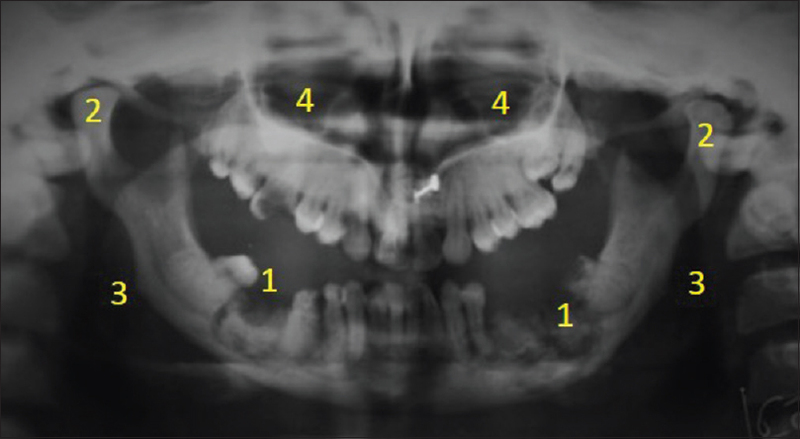 Alves N, Cantín M. Clinical and radiographic maxillofacial features of pycnodysostosis. Int J Clin Exp Med 2014;7:492-6. Lykkegaard Nielsen E. Pycnodysostosis. Six cases with new symptoms and an autopsy. Acta Paediatr Scand 1974;63:437-42. Nirupama C, Sarasakavitha D, Palanivelu S, Guhan B. Pyknodyostosis: A case report or rare entity. J Indian Acad Oral Med Radiol 2013;25:161-3. Ramaiah KK, George GB, Padiyath S, Sethuraman R, Cherian B. Pyknodysostosis: Report of a rare case with review of literature. Imaging Sci Dent 2011;41:177-81. Girbal I, Nunes T, Medeira A, Bandeira T. Pycnodysostosis with novel gene mutation and severe obstructive sleep apnoea: Management of a complex case. BMJ Case Rep 2013; [doi:10.1136/bcr-2013-200590]. Serap T. Current research on pycnodysostosis. Intractable Rare Dis Res 2014;3:91-3.